Doppler Photo: Photos and stories by Omari Stephens: ROFL! Sometimes I surprise myself with how good I am at some things. One thing I am good at is panning. 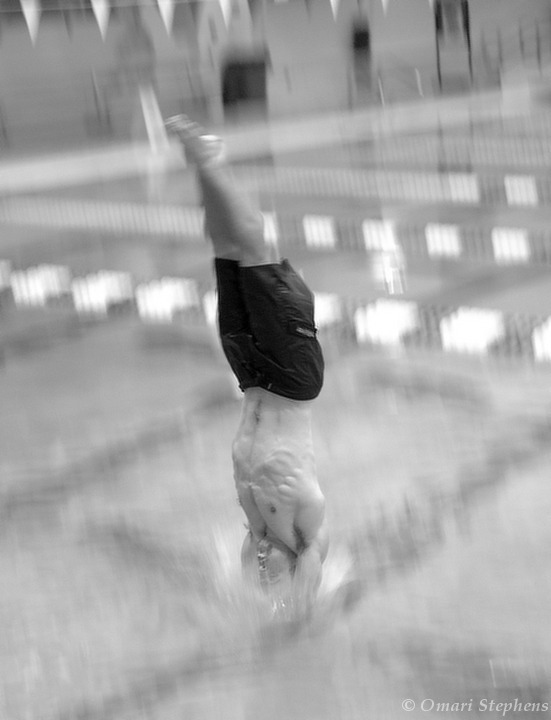 The image above is one of my favorite panned shots, of Nate taking his first "dive" off of a 3-meter platform. Exposure was 1/80s at f/4.5 and ISO800. (For folks who care, this was 60mm on a DX body, so 90mm 35mm-equivalent). Oddly enough, another of my favorite panned shots is of another Nate in mid-vault. I'll undoubtedly have that here at some point. Anyway, the actual subject of this post deals with the title, which is (without the exclamation point) the title of a side project I've been hacking on tonight, instead of packing for my trip to MIT in 4 hours. < xsdg> > CAN HAS STDIO? < xsdg> > VISIBLE "HAI WORLD!" < erikh> heh, you're writing a lolcode parser?